What Drives Foodservice in Retail? JACKSONVILLE, Fla., & CHICAGO -- Fifty-two percent of consumers have purchased a prepared or made-to-order meal at a convenience store in the past month, and over the past three months, 22% of consumers ate prepared foods at home purchased at a c-store and 14% ate prepared foods in the dining area of a convenience store. The numbers, reported in the second annual "The Why? Behind the Dine" report from Acosta and Technomic Inc., suggest an increasing willingness by consumers to purchase prepared food from traditionally packaged-food retail destinations. “The changing food landscape includes many meal solutions that didn’t even exist five or 10 years ago," the report says. "When asked about their behaviors during the three months prior to the survey, diners reported purchasing food across a wide range of options." These options included grocery stores, which show an even greater popularity with consumers as a prepared-food alternative. 57% of consumers ate prepared foods at home from a grocery store. 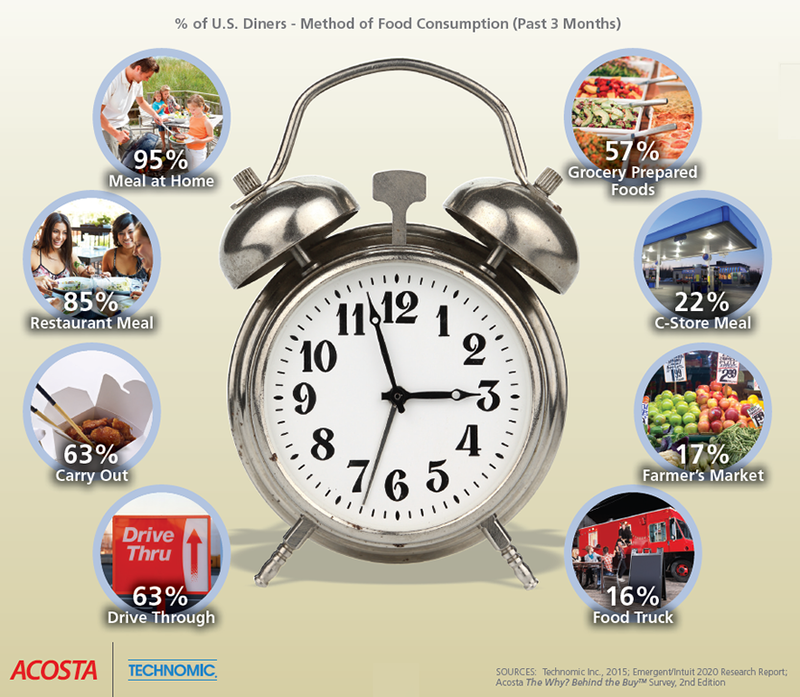 25% of consumers ate prepared foods in the grocery store dining area. 12% of consumers ordered groceries online for pickup at the store. And the younger the consumer, the more willing they are to purchase food from a grocer. 64% of millennial diners (18-34) ate grocery prepared food. 60% of Gen X diners (35-50) ate grocery prepared food. 51% of baby-boomer diners ate grocery prepared food. “There have been a variety of factors affecting the food landscape over the past 30 years,” said Colin Stewart, senior vice president of Acosta, Jacksonville, Fla. “Consumers’ desire for more convenient options in today’s fast-paced world is driving new technologies like mobile apps that can be used to track nutrition, find restaurant and retailer promotions and offers, or order foodservice and groceries for home delivery." According to the report, diners are increasingly using digital and social tools, as well as loyalty cards, to navigate their dining decisions. Four in 10 diners are using the Internet to find the best restaurant deals. Six in 10 millennials and four in 10 Gen X diners agreed that they often read restaurant menus online before going out to eat. 15% of U.S. diners use social networking regularly for restaurant dining. "Coupled with the local-ingredient food movement gaining momentum, foodservice operators must continue to adapt within the evolving food-consumption space by embracing digital and mobile tools, and being transparent about the quality of their menu ingredients," Stewart said. Click here to access the complete second edition "The Why? Behind The Dine" study. Acosta is a leading sales and marketing company that provides a range of outsourced sales, marketing and retail merchandising services. Acosta Foodservice provides integrated sales and marketing solutions for major food and nonfood manufacturers, distributors and operators across all away from home meal channels. Chicago-based Technomic Inc., a Winsight company, delivers a 360-degree view of the food industry. It drives growth and profitability to its clients by providing reliable, consumer-grounded, channel-relevant data, with forward-looking, strategic insights.